06 Euro Youth Camp - Should We Continue? We arrived at camp exhausted and ready to quit. It had been a difficult three months with myself having a miscarriage and John working extra hours at work to facilitate a hospital relocation. We had already talked about this being our final year arranging camp, and we were thinking about our exit strategy. Then Monday night at camp happened . . . .
We had taken several youth whom we had met through our Kidz Klub ministry, but who were now too old to attend. They were extremely excited about attending youth camp; most of them are from fatherless homes. The atmosphere in the car on the way to camp was one of expectation. I left the kids at camp to go to the airport to collect two boys who were coming over from France. When we returned, the evening meeting was well under way and we just slipped in the back of the meeting hall. Dave preached in his usually motivating style and gave an opportunity to any who wanted to respond to the gospel to do so. Five kids got born again that night and right there and then we decided that all the blood, sweat and tears had been worth it. They got filled with the Holy Spirit, along with some others, and Youth Camp was off to a great start. After a VERY late night, Tuesday morning appeared on the horizon bringing with it some conflict between two of the groups of girls, and young people deciding that they didn't like the groups they had been allocated to. So the morning consisted mainly of diplomacy and advocacy. The kids got on with the stuff they had to do and had some excellent workshop time. The conflict between the girls continued into Wednesday despite our best efforts, and by the time Wednesday night meeting came I said to the Lord, "You had better do something about this now, because I am all out of ideas." Don't you know that our weaknesses allow room for God to move? That evening Dave preached a message about Imitating God, and he talked about the time when God told him to act like He acts. So at the end of the message Dave said, "Now we are going to have a time when I act like God. It is going to be just as if Jesus was here Himself - I am going to mime what he would do." The Holy Spirit's presence was so tangible at that moment, it was awesome. Dave began ministering to the young people, talking to them and saying what God would say. Everyone began crying, and God was doing some healing miracles, not only physically but emotionally too. What I had found impossible to achieve reconciliation between the groups of girls at odds with each other - God did in the way only He can. He melted hearts and then knit them together. Praise God! That night was so special. One girl told me, "I have never experienced God in worship the way I did tonight." Certainly it was a life-changing encounter with the Lord. During the week eight young people gave their lives to the Lord. I don't know how many got filled with the Spirit, but it was many more. We were humbled to think that God used us in a small way to make this camp happen, to see lasting change happen in the lives of the young people, but most of all to see some of His children find their way home to the Father. When it was time to leave on Friday no one wanted to go. The boys from France had to leave early to catch their flight. It took twenty minutes for them to get from their seats into my car outside because of everyone hugging and loving on them. Each of the girls we took to camp had red eyes as they clung to the friends that they made through the week. God has made some friendships that will last a lifetime. 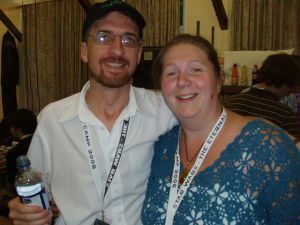 Karen Blackburn and her husband, John, pastor Heartbeat Christian Centre in Coventry, England. Their primary focus of time, energy, outreach and finances is on children's ministry and young people. They have been the coordinators of the FMIN Euro Youth Camp in England for the past two years.